Buenos Aires is perhaps the most beautiful capital in all of South America. The city is full of splendid architecture, green parks, with many social and cultural activities. The Tipsy Gypsies traveled here with a tour guide, but we made sure to customize our itinerary to our needs. Here is a list of our FAVORITE things to do and see in Buenos Aires. Tango is the number one dance in Argentina, and it seems that all Argentines know how to tango. The dance originated in brothels and bars near ports, but it has since became a classy, yet seductive dance. You can see a great show with professional dancers and musicians at La Ventana, accompanied with dinner and wine, but if you want to save some money you can watch locals dancing tango in parks. We actually enjoyed this more than the formal show. In some large squares, like in San Telmo, strangers meet to dance together every Sunday evening. Men and women, young and old, bring their best shoes, and dance the night away to passionate tango tunes. Although it doesn't look like much from the outside, this building holds a beautiful gem inside; a historical theater converted into a bookstore. The ceilings are covered with frescos, intricate freezes ornate the balconies and the red velvet curtains drape over the old stage. They have a massive collection of books, mostly in Spanish though, but this is definitely a place worth visiting. Buenos Aires has over 250 parks and green spaces in the city, and locals definitely take advantage of it. On any given day, you can see people hanging out in the parks with blankets, while others come here to exercise. 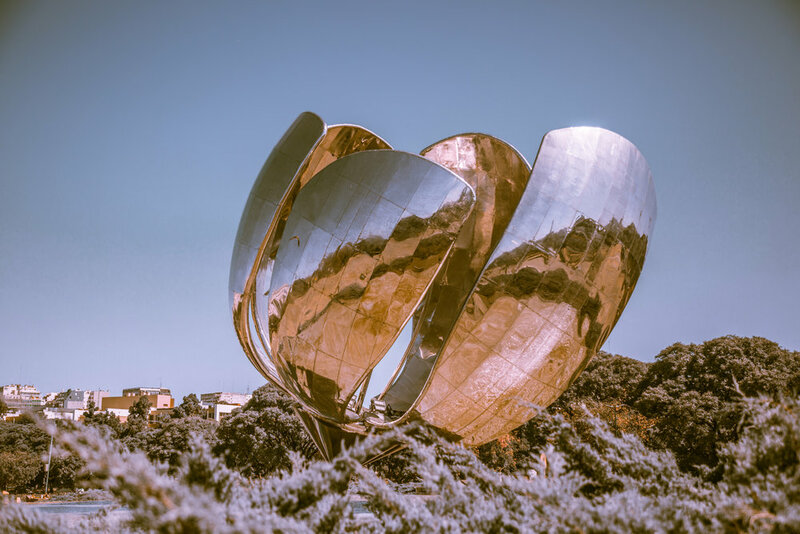 Floralis Genérica is an aluminum sculpture located in Plaza de Las Naciones Unidas, near the corner of Av. Figueroa Alcorta and J. A. Biblioni, La Recoleta. It was designed by an architect Eduardo Catalano, who gifted it to the city, as an act of gratitude for receiving his education here. The petals of this art piece are designed to work with the sunlight. They close at night and open up with the first sunlight. The sculpture is notorious for breaking, and unfortunately it wasn't working when we visited a few months ago. We have heard that is has been fixed since. Despite that, we still enoyed looking at it. Buenos Aires has some of the best street art, that we have seen. Many artists are commisioned, by the city to create beautiful murals, on otherwise boring concrete structures. The artwork usually represents something related to the culture and the neighborhood it's located in, like in this case, the tango dancers from La Boca. You will see a lot of drawings with soccer players and such. The mural below was painted by a very famous artist, Ron Martin, known for his large scale realistic paintings. It is located in La Boca, near a soccer stadium (299 Martin Rodriguez, and 20 de Septiembre). It's a tradition in Buenos Aires to meet at the Hipodromo, horse track on weekends. This sport is highly popular, and although gambling is illegal in B.A, you sure can place a bet on your favorite horse totally legal. Sundays entrance is free of charge. Since this activity is so popular, there is no need for fancy hats and pompous clothes. People dress casually, except when the most prestigious event takes it's place in November, during the Gran Premio Nacional. This is the best street food in Buenos Aires. Choripan is a type of sandwich with grilled chorizo sausage, and chimichurri (a spicy, herby sauce). You have to try it! *One of us doesn't eat meat. Although it sounds funny, we got one of these with just bread and chimichurri. No refunds! This used to be a working-class neighborhood, so the rent was cheap. Therefore, artists flocked to this neighborhood bringing lots of color with them. El Caminito street is the most lively in the neighborhood, with street vendors and art performers. It's very busy and touristy, but it is worth walking around. It's a nice place to grab lunch or drinks, and visit some art galleries. Definitely make sure to watch your belonging here, as we were warned many times about driveby bag snatchings. This area is notorious for pickpockets too, but you shouldn't have to worry about violent crime. A cafe located in San Telmo, with fantastic atmosphere. El Federal, is a classic establishment, with a charming interior with wood details like the ornate counter and bar, and stained glass windows. Although it feels like it's been here forever, we were surprised to learn that some of the architectural elements have been moved here from a run down mansion, when the bar opened. Despite that, this is one of the oldest cafes in Buenos Aires and it's a great place to hang out for breakfast, lunch and dinner. We came here in the morning, when it was still slow, for coffee and medialunas. A cute little street where the houses are covered with colorful mosaics. It all started when one artist, who still lives there, adorned the exterior wall of his house. The neighbors quickly asked him to design their houses in the same style. Nowadays, the whole street is covered with these beautiful mosaics. If you have the time and want to visit another country, you can catch a quick trip from B.A to Colonia in Uruguay. We went early in the morning but found it was too much time for this small town. 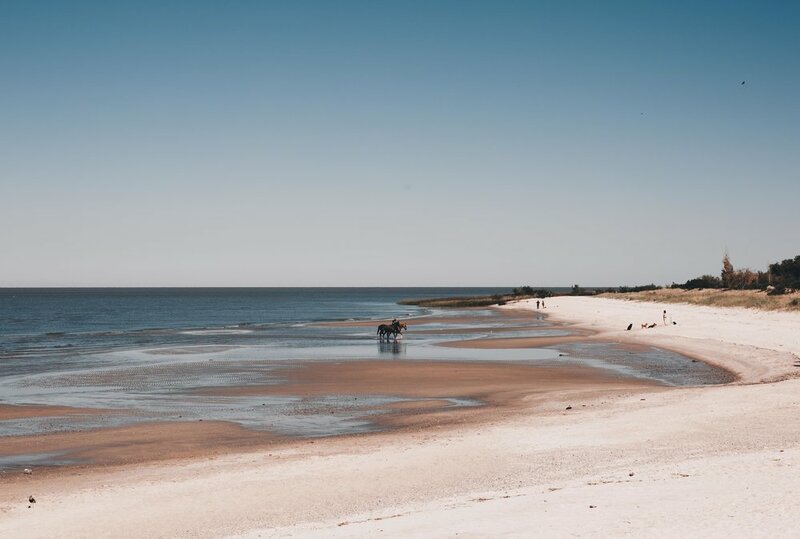 We recommend a half day excursion, leaving about noon or one, so you can walk around and have a nice sunset dinner before heading back to Buenos Aires. Did you know that a famous Polish singer Kora, wrote and sang about Buenos Aires, way back in the 80's, back when Polish weren't allowed to travel much? The title translates into "Divine Buenos Aires". Kora was a goddess to me. The essence of a strong, yet feminie woman, and so unique. Even though this song debuted in the 80's, the era I was born, it's timeless like all her music. I grew up listening and admiring this beautiful woman since I was a child. If you wonder where I got my sassiness from, it's because I imitated Kora, and I am still inspired to be as honest as she was. Kora passed away, on 28 July 2018.